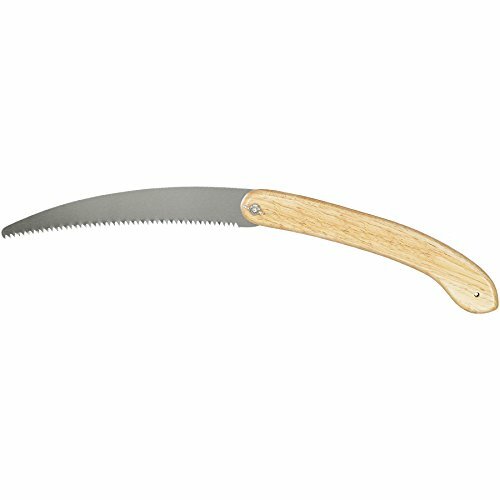 The 10-1/2" Folding Pruning Saw is designed to be as comfortable in your hand as it is effective in the field. This self-cleaning raker tooth model resists binding on green or woody limbs. Designed for small to medium branches, the 10-1/2-inch blade folds into the handle for safety, storage, and easy transport. It has a curved blade design that puts more teeth into the branch for faster cutting. The blade is made of tempered steel alloy that resists rust and holds its edge. The filed and set, precision-ground teeth cut without binding, and there are six teeth per inch to cut on the pull stroke. The handle is made of curved hardwood for a solid grip. All of these special features make Corona pruning saws several cuts above the rest. View More In Pruning Saws.